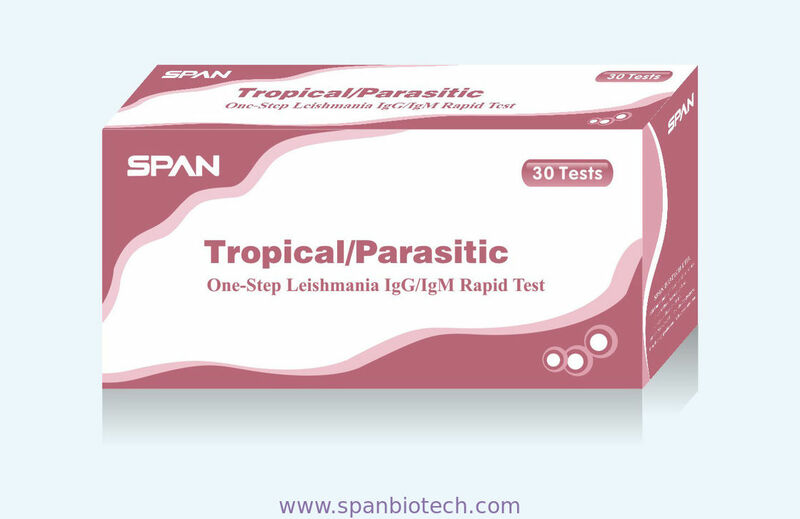 The Leishmania IgG/IgM Rapid Test is a lateral flow immunoassay for the qualitative detection of antibodies including IgG and IgM to the subspecies of the Leishmania donovani (L. donovani), the Visceral leishmaniasis causative protozoans in human serum or plasma. This test is intended to be used as a screening test and as an aid in the diagnosis of the disease of Visceral leishmaniasis. Any reactive specimen with the Leishmania IgG/IgM Rapid Test must be confirmed with alternative testing method(s). Visceral leishmaniasis, or Kala-azar, is a disseminated infection caused by several subspecies of the L. donovani. The disease is estimated by the World Health Organization (WHO) to affect approximately 12 million people in 88 countries1. It is transmitted to humans by bites of the Phlebotomus sandflies, which acquire infection from feeding on infected animals. Though it is a disease for poor countries, in Southern Europe, it has become the leading opportunistic infection in AIDS patients2-3. Identification of L. donovani organism from the blood, bone marrow, liver, lymph nodes or the spleen provides a definite means of diagnosis. However, these test methods are limited by the sampling method and the special instrument requirement. Serological detection of anti-L. donovani Ab is found to be an excellent marker for the infection of Visceral leishmaniasis. Tests used in clinic include: ELISA, fluorescent antibody and direct agglutination tests4-5. Recently, utilization of L. donovani specific protein in the test has improved the sensitivity and specificity dramatically6-7. The Leishmania IgG/IgM Rapid Test is a recombinant protein based serological test, which detects antibodies including IgG, IgM and IgA to the L. Donovani. This test provides a reliable result within 10 minutes without any instrumentation requirements. The Leishmania IgG/IgM Rapid Test is a lateral flow chromatographic immunoassay. The test cassette consists of: 1) a burgundy colored conjugate pad containing recombinant L. donovani specific antigen conjugated with colloid gold (Leishmania conjugates) and rabbit IgG-gold conjugates, 2) a nitrocellulose membrane strip containing a test band (T band) and a control band (C band). The T band is pre-coated with un-conjugated L. donovani antigen, and the C band is pre-coated with goat anti-rabbit IgG antibody. When an adequate volume of test specimen is dispensed into the sample well of the test cassette, the specimen migrates by capillary action across the cassette. Anti- L. donovani Ab if present in the specimen will bind to the Leishmania conjugates. The immunocomplex is then captured on the membrane by the pre-coated antigen, forming a burgundy colored T band, indicating a L. donovani Ab positive test result. Absence of the T band suggests a negative result. The test contains an internal control (C band) which should exhibit a burgundy colored band of the immunocomplex of goat anti-rabbit IgG/rabbit IgG-gold conjugate regardless of the color development on the T band. Otherwise, the test result is invalid and the specimen must be retested with another device. Store as packaged in the sealed pouch either at room temperature or refrigerated (2-30°C). The test device is stable through the expiration date printed on the sealed pouch. The test device must remain in the sealed pouch until use. DO NOT FREEZE. Do not use beyond the expiration date.